Mayor Roy D. Buol of Dubuque, Iowa, has been a champion for sustainability since his 2005 election, when he campaigned on the concept of citizens as partners with government. Throughout the past 10 years, he and fellow council members have continued this focus, working with residents to establish Dubuque’s sustainability model, which rests on three pillars: economic prosperity, environmental integrity and social cultural vibrancy. Social sustainability standards tend to be people-centered and grounded in actions that balance fundamental needs, include all groups, remove barriers to potential, are continually developed and are financially sustainable. These standards align with the work of civil and human rights agencies in local government. Yet meeting such standards cannot be the role of government alone. Social problems are complex. Every sector and every individual ultimately bears a share of the responsibility for success. For too many years, work in the civil and human rights arena has been highly politicized and focused on blaming and finger pointing rather than learning and collaborating to address inequities. The complexity of today’s reality demands a shift in focus. Here in Dubuque, the Collective Impact framework developed by John Kania and Mark Kramer has proven to be a helpful way of thinking about how to share responsibility and organize our work. In 2012, a group of community leaders convened to discuss how changing community demographics were affecting us, positively and negatively. Some individuals were facing challenges accessing resources. Neighborhoods were struggling with cohesion. Employers were concerned about their ability to recruit and retain talent. The group formed “Inclusive Dubuque,” a network of partners dedicated to furthering equity and inclusion in Dubuque. With the support of a consultant, leadership across various sectors first aligned. Ultimately, the following vision developed: a community where all people feel respected, valued and engaged. In 2013, Inclusive Dubuque officially launched. Since that time, the network has continued to meet and grow its membership. Today, Inclusive Dubuque consists of more than 50 partners—both organizations and individuals—from education, business, faith, labor, nonprofit and government. The Community Foundation of Greater Dubuque serves as the backbone organization and the group functions as a peer-learning network, convening regular meetings, engaging regional and national partners and supporting activities led by network partners. In 2015, the network launched the Equity Profile Project. From February through August, the committee leading the effort focused on gathering data around one of the following focus areas: economic well-being, health, education, housing, safe neighborhoods, transportation and arts and culture. Data was gathered from state and national sources (such as the census), local experts serving in each of the focus areas and community members through the administration of community surveys and participation in community dialogue sessions. They also enlisted the support of partner organizations. Working with the Interactivity Foundation, 24 community members were trained as facilitators and led dialogue sessions in the community. Ultimately, 584 community members attended 60 community dialogues and 1,995 community members completed online surveys. Approximately 305 community members signed up to stay connected and some of them have now moved to participating in working groups. 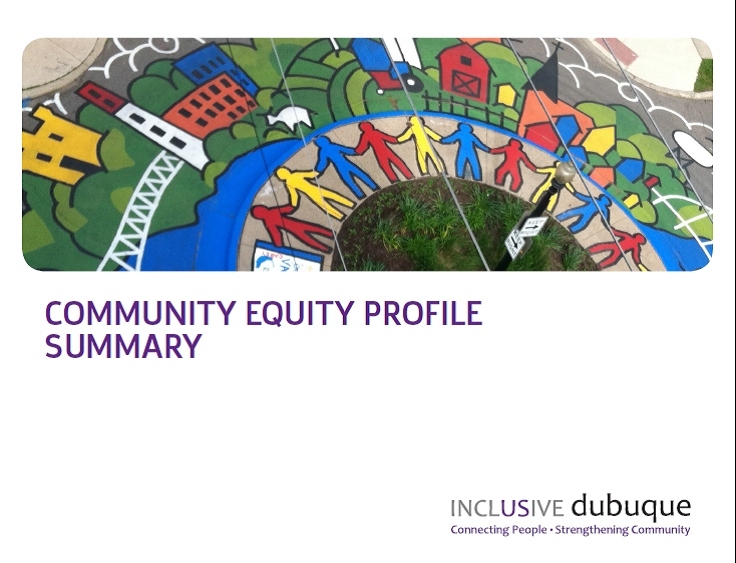 The Community Equity Profile summary can be viewed here. We are now at the stage of developing working groups for each of the core focus areas. These working groups are tasked with identifying key strategies and action areas. Similar to many communities across our nation, racial disparities reveal themselves in the data. Working with the Local and Regional Government Alliance on Race and Equity and the Results Leadership Group, we have hosted educational sessions to help normalize conversations around race, learn about using a results-based accountability framework to track our progress and infuse an equity lens in our decisionmaking. The goal for working groups is to use a results-based framework to determine where our strategies will focus and what indicators we will track at the population level in order to be able to evaluate our progress throughout time. Finally, the City of Dubuque has begun more closely examining the ways in which our operations contribute toward equity and inclusion, whether that is through delivery of our services, development of our workforce or partnering with residents and other organizations on actions to move equity forward. Future articles will focus on the role the city has played, and continues to play, in the Inclusive Dubuque effort. Author: Kelly Larson serves as the human rights director for the City of Dubuque, Iowa. She has degrees in law and psychology from the University of Iowa and an intercultural professional certificate from the Institute on Intercultural Communication. She can be reached at [email protected]. Congratulations on the progress in equity and inclusion in Dubuque, Iowa! We welcome the roots of inclusion in the UN Convention on the Rights of Persons with Disabilities (2006)which President Barack Obama signed in 2009. Equitable city and transportation development are a high priority in the US, together with leadership in the global econommy in the green context. Thank you to David Towell and John O’Brien for their schema on inclusive development in the book, Public Administration and Disability: Community Services Administration in the US(Racino, 2014).